JIMMY'S 485HP DINAN BMW 540i ARTICLE & REVIEW IN "EUROPEAN CAR MAGAZINE"
MY 540i IS FEATURING IN THE EUROPEAN CAR MAGAZINE IN THE MARCH, 2002 ISSUE. 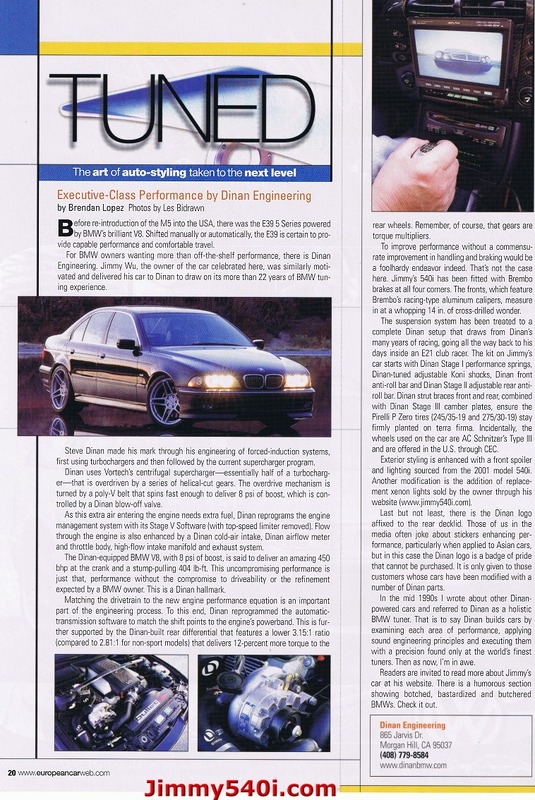 THE HEADLINE OF THIS ARTICLE IS "TUNED" AND THE TITLE IS "THE ART OF AUTO-STYLING TAKEN TO THE NEXT LEVEL", THIS ARTICLE IS LOCATED ON PAGE 20. IT WAS A WONDERFUL EXPERIENCE WORKING WITH PEOPLE AT EUROPEAN CAR, MY SPECIAL THANKS TO LES BIDRAWN ~ THE SENIOR EDITOR OF EUROPEAN CAR MAGAZINE, BRENDAN LOPEZ ~ THE TECHNICAL EDITOR & PABLO MAZLUMIAN. HERE ARE THE SOME PICTURES FROM THE MAGAZINE. YOU CAN READ THE ARTICLE AT THE BOTTOM OF THIS PAGE. 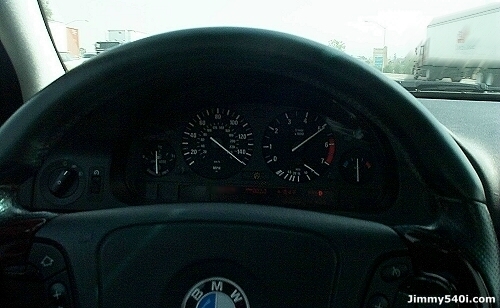 Before the re-intoroduction of of the M5 into the USA, there was the E39 5-Series powered by BMW's brilliant V8. Shifted manually or automatically, the E39 is certain to provide capable performance and comfortable travel. For BMW owners wanted more than off-the-shelf performance, there is Dinan Engineering. Jimmy, the owner of the car celebrated here, was similarly motivated and delivered his car to Dinan to draw on its more than 22 years of BMW tuning experience. Steve Dinan made his mark through his engineering of forced-induction systems, first using the turbocharger and the followed by the current supercharger program. Dinan uses Vortech's centrifugal supercharger - essentially half of a turbocharger - that is overdriven by a series of helical-cut gears. 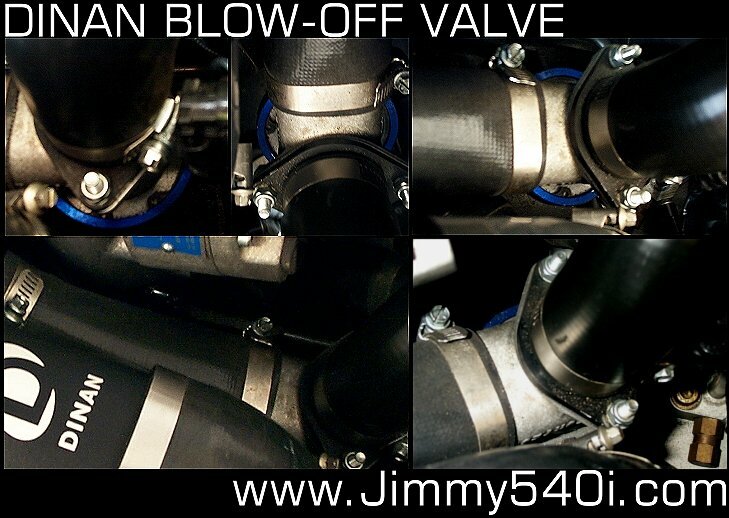 The overdrive mechanism is tuned by a poly-V belt that spins fast enough to deliver 8 psi of boost, which is controlled by a Dinan blow-off valve. As this extra air entering the engine needs extra fuel. Dinan reprograms the engine management system with its Stage V Software (with top-speed limiter removed). Flow through the engine also enhanced by a Dinan cold-air intake, Dinan air-flow meter and throttle body, high-flow intake manifold and exhaust system. The Dinan-equipped BMW V8, with 8 psi of boost, is said to deliver an amazing 450 bhp at the crank and a stump-pulling 404 lb-ft. This uncompromising performance is just that, performance without the compromise to driveability or the refinement expected by a BMW owner. This is a Dinan hallmark. Matching the drivetrain to the new engine performance equation is an important part of the engineering process. To this end, Dinan reprogrammed the automatic-transmission software to match the shift points to the engine's powerband. This is further supported by the Dinan-built rear differential that features a lower 3.15:1 ratio (compared to 2.81:1 for non-sport models) that delivers 12-percent more torque to the rear wheels. Remember, of course, that gears are torque multipliers. To improve performance without a commensurate improvement in handling and braking would be a foolhardy endeavor indeed. That's not the case here. 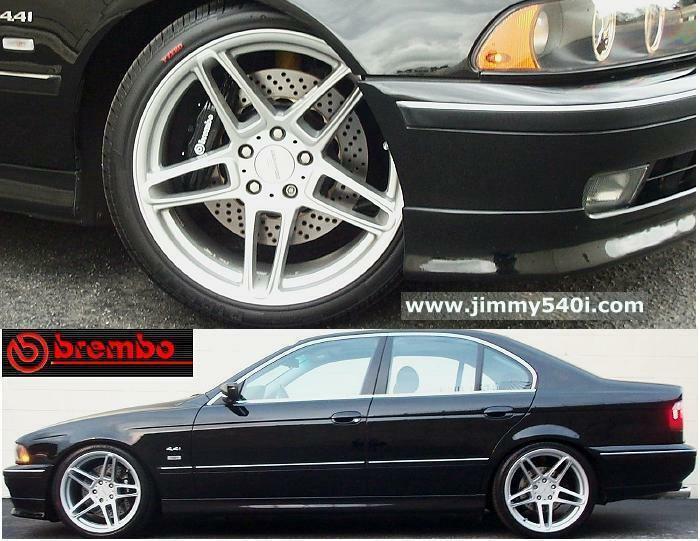 Jimmy's 540i has been fitted with Brembo brakes at all four corners. The fronts, which feature Brembo's racing-typing aluminum calipers, measure in at a whopping 14 in. of cross-drilled wonder. The suspension system has been treated to a complete Dinan setup that draws from Dinan's many years of racing, going all the way back to his days inside an E21 club racer. The kit on Jimmy's car starts with Dinan Stage 1 performance springs, Dinan-tuned adjustable Koni shocks, Dinan front anti-roll bar and Dinan Stage II adjustable rear anti-roll bar. Dinan strut braces front and rear, combined with Dinan stage III camber plates, ensure the Pirelli P Zero tires (245/35-19 and 275/30-19) stay firmly planted on terra firma. Incidentally, the wheels used on the car are AC Schnitzer's Type III and are offered in the U.S. through CEC. 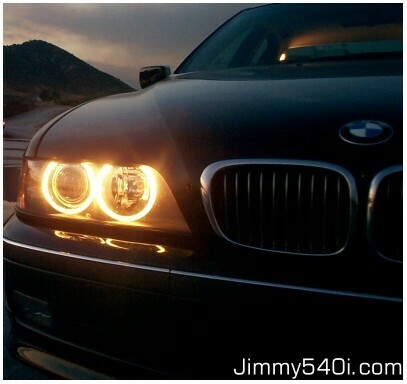 Exterior styling is enhanced with a front spoiler and lighting sourced from the 2001 model 540i. Another modification is the addition of replacement Xenon Lights sold by the owner through his website (www.jimmy540i.com). Last but not least, there is the Dinan logo affixed to the rear decklid. Those of us in the media often joke about stickers enhancing performance, particularly when applied to Asian cars, but in this case the Dinan logo is a badge of pride that cannot be purchased. It is only given to those customers whose cars have been modified with a number of Dinan parts. 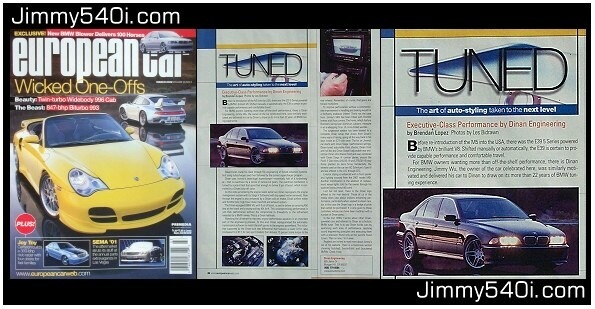 In the mid 1990s I wrote about other Dinan-powered cars and referred to Dinan as a holistic BMW tuner. That is to say Dinan builds cars by examining each area of performance, applying sound engineering principles and executing them with a precision found only at the world's finest tuners. Then as now, I'm in awe. Readers are invited to read more that Jimmy's car at his website. There is a humorous section showing botched, bastardized and butchered BMWs. Check it out.